In October 2008 a band of six aging ex-Kongwa School pupils set off to Kongwa from far flung destinations around the globe for the 60th anniversary of the founding of our school – now Mnyakongo School. Few of us had been back since we all left in 1958 … 50 years ago! We happy few could not anticipate the impact the journey back would make upon us all. Kongwa School opened in 1948 for the children of the failed British government Overseas Food Corporation Groundnut Scheme and was expanded in 1952 to utilize the abandoned buildings of the scheme. 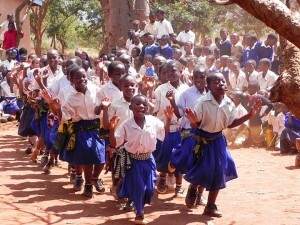 The expansion drew colonial children from all over Tanzania – or “Tanganyika Territory,” as it was called under colonial rule. At its height, before it closed as a boarding school for colonial children in 1958, it numbered 400 European children ages 7 to 19 years. So here was this group of grey-haired wazungu returning after 50 years – for after Tanzanian independence most of us were spirited away to other parts of the world by our parents, to England, to Australia, to America. 50 years! How would we be received? Would we recognize anything? And then the miracle happened. As the vehicles in which we were travelling pulled up at the main school building I heard someone say, “That was my classroom;” another, “There’s the playground.” We were escorted to a seating area in front of our old school building. 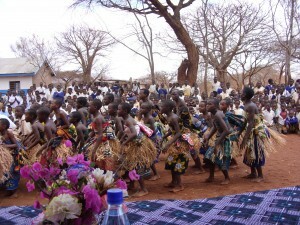 The teachers (all 35) and the children (all 800) had gathered to greet us. 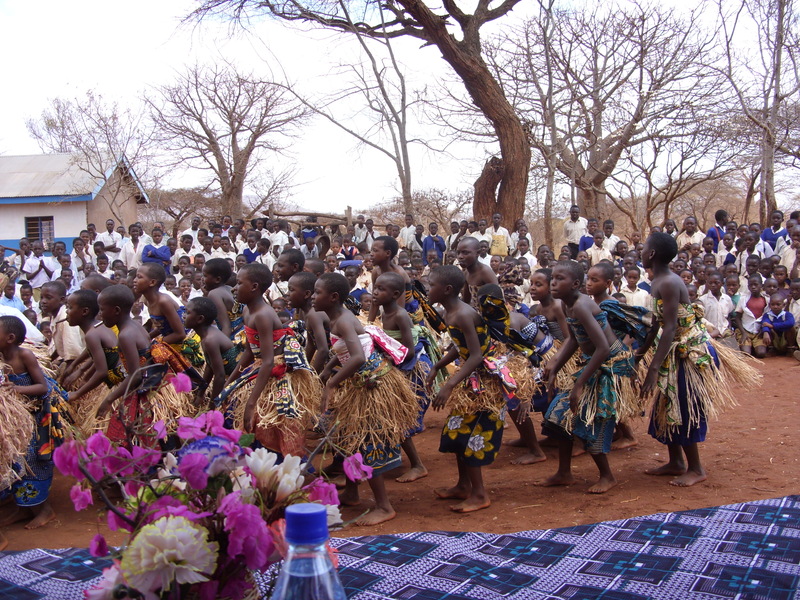 As the children danced and sang for us we were overcome with the most extraordinary and unexpected emotion. We each sat with tears running down our faces having been instantaneously transported back to our own childhoods when we, the same age as the children before us, had gathered and played on that same piece of bare red earth. We had not anticipated such a reception, such welcoming openness and genuine interest in us and our connection to this place. 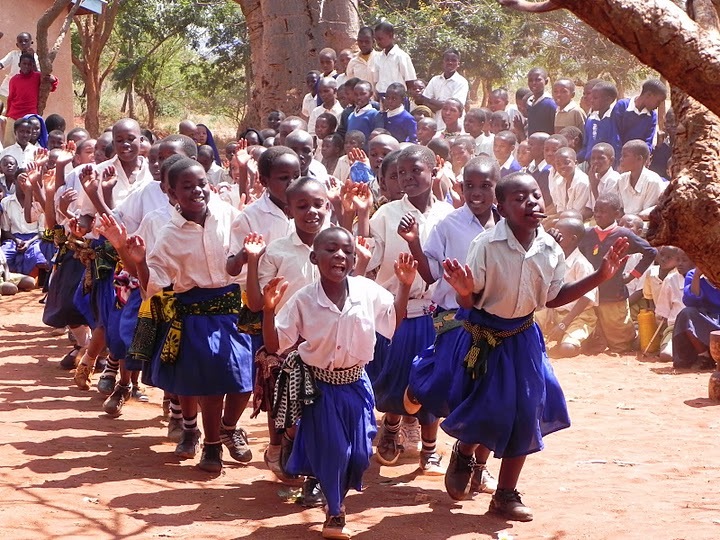 Even when we each, in halting Swahili, thanked the children for their welcome, I do not think the children could conceive that these ancient wazungu could once have been in their place. The feelings we experienced at the welcoming celebration spilled over to our exploration of the school grounds and beyond. We recognized the hills, the rocky outcrop we called “Snake Rock,” the church on the hill, the baobab trees still standing where they had been 50 years ago. One baobab stood out in particular: a large hollow tree which boys would climb up inside by means of pegs inserted into the interior of the trunk to sit in the branches and watch cricket matches. As we wandered about, the memories came flooding back, responses to the world around us long put aside. I searched out the fruit of a baobab tree, broke open the pod, and we all sucked the acidic pulp from the seeds, remembering the taste. Then breaking open the brown pip and eating the nut inside – again the taste remembered … rather like that of a bitter almond. Those early years of our lives – for most of us were at boarding school there from ages 7 to 12 – were powerfully shaped by the African environment. The day ended with all of us sitting on top of Snake Rock looking out over the town of Kongwa. Our world was still there, hidden just beneath the surface. We were all breathless and uplifted by the events of the day. We did not want the feeling to end. It was at this point that we all made a pact to assist the education of the children in whatever way we could. All contributed some money and a local carpentry shop was commissioned to build 50 new desks for the children. They are already in use. So, in the spirit of President Obama’s call for Americans to reach out to the global community – and especially to “feed hungry minds” – I created an initiative to install a small library at Mnyakongo School. The school is off the beaten track of most tourists and visitors to Tanzania. It had few books beyond essential texts. I collected 6,000 books with the help of friends, teachers and students – including dictionaries, children encyclopedias, picture storybooks, and other non-fiction. In addition, my sister and I added 1,000 Swahili textbooks and readers to complement the donated collection. The money raised to fund these projects was donated by ex-Kongwa pupils and well-wishers around the globe. The San Diego State University (SDSU) 2010 Homecoming King, Rex Brown, and Homecoming Queen, Teresa Banko, adopted the project and raised funds to purchase a 20-foot container that was shipped to the school loaded with books and supplies. The library is now complete – a large new room lined with bookshelves full of books with chairs and tables for the children. 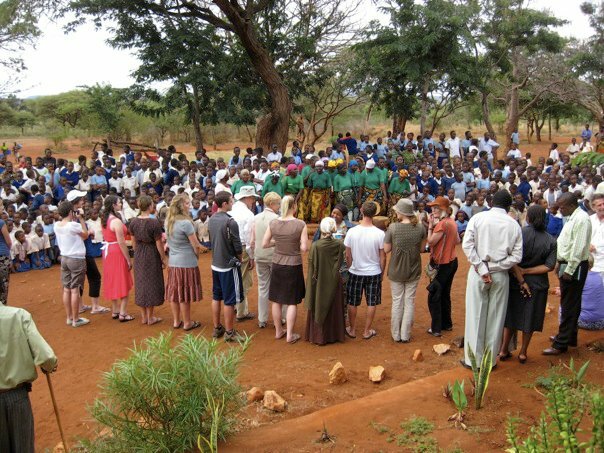 Ideas I have for the future include SDSU faculty and student travel to Mnyakongo School to assist with the running of the library installed in 2010 – especially cataloguing books and checkout for the children. Further, we intend to purchase more Swahili books for the library to complement the English books sent over in 2010. We plan to redecorate and purchase desks for the room currently used by the youngest children in the school – the old mess that is still standing. Currently the school day for the pupils is curtailed because of the lack of a school lunch. 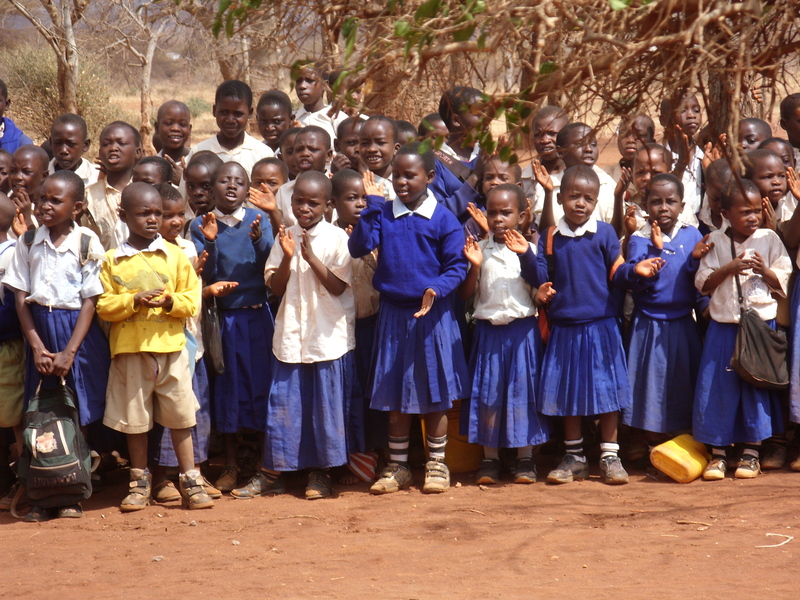 The children walk to and from school so their day is long. The purchase of a small herd of milk goats and the establishment of a small field in which to grow maize would be a positive step in ensuring a school lunch of maize porridge and goat milk for the youngest children. The children would then be able to stay for a full day of school – fulfilling a United Nations Millennium Goal for at least one school. As a boy I have only the dimmest memories of my actual lessons at Kongwa School, but my time there did instill in me a special understanding and appreciation of Africa, its people and the land. I do, however, remember the school motto, in Latin, “Conabor”: “I will endeavour” – or more colloquially “I’ll give it a shot.” Perhaps something rubbed off on its colonial-era students after all.